Wet the bulgur with the water for 10 mins. Rub in the hot pepper paste until the spices and the paste are thoroughly distributed. Wet your hands as you knead in the beef mince. Knead adding water from time to time until you get a soft (not watery) dough. Don't over knead the kibbeh dough. Over-kneading will make it chewy. Sweat the onions in 3 tbsp oil. Stir in the meat and cook until all the water that it produces evaporates. Cook for 5 more minutes and turn off the heat. let it cool in the fridge. Spread half the oil on the bottom of the pan. Spread half the dough evenly. Spread the stuffing on top. Spread the rest of the dough on a nylon sheet the size of the pan. Flip it on the pan and remove the nylon. Wet your hands and pat the dough to cover the whole surface of the pan. 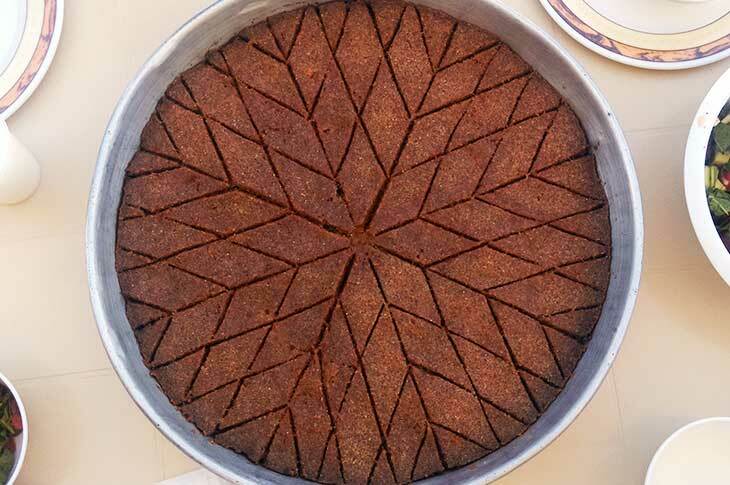 Using a knife, slice the kibbeh into 8 slices cutting to the bottom. Again with the knife, score only the top layer creating the design you want. Pour the rest of the oil on top. Bake for 40-45 mins until the sides separate from the pan. If you like your Kibbeh in a pan to be thick, use a 35 cm pan; if you like it thin, use a 40cm pan. We enjoy Sinurgha with a glass of cold ayran or a side of simple salad.